At the meeting of BRICS countries in New Delhi, the Russian Minister of Economic Development E. Nabiullina said that Russia intends to continue to counter "green protectionism." Representatives of environmental organizations and experts in Russia believe that the best option of the struggle for world markets is not rejection of green development, but creation of domestic market for greenhouse gas emission reductions. 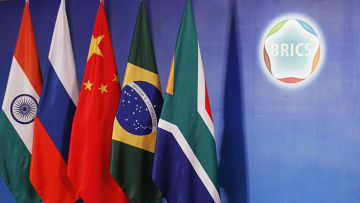 BRICS countries today are considered the main engine of world economic development. Brazil, Russia, India, China, and South Africa together cover 30 % of the Earth's surface, their population makes 42 % of the world's population, their gross domestic product (GDP) makes 18 % of the global GDP, and they own 15 % of the world trade. Growth trend will be strengthened: in 2015, GDP in BRICS will reach 22 % of the world one, while it amounted to only 8 % in 2000. The "dizzying" rapid development of these economies is often due to exploitation of natural resources, using carbon-intensive and environmentally harmful technologies. On the eve of the BRICS meeting, several events were held in Moscow to form a strategy to counter the European policy of green growth and carbon regulation. In these actions,"Kommersant" has already seen "formation of opposition in the fight against carbon protectionism." The main conflict lies in the fact that most of developed countries see green growth as a basis for development, but developing countries refer to it as to a factor limiting their economic development. The latest flashpoint of the conflict is introduction of EU payments for carbon emissions in the aviation sector. Officially, only China showed its opposition to participate in the carbon regulation: in the beginning of January, Aviation Administration of China has banned national airlines to participate in the European trading scheme for greenhouse gas emissions and to raise air fares due to the new EU requirements. In addition, in February, China blocked purchase of Airbus aircraft by domestic companies. Russia had displayed no official actions in the similar direction yet, but opponents of the EU carbon measures in the country clearly consolidate. At the Russian Ministry of Transport and the Ministry of Economic Development, the possibility of similar actions is being discussed. The main reason for this is high carbon intensity of Russia’s exports. Namely this makes it extremely vulnerable to any attempts to supranational emission regulations. Judging by the context of the BRICS talks held in New Delhi, carbon trading and a number of other confrontations with Europe will not stop in the near future. The joint statement issued after the meeting reads: "Currently the situation in the world economy is a challenge for all countries, including BRICS. BRICS countries should strengthen coordination to resist trade protectionism ..." In addition, the summit decisions include agreements on cooperation in nuclear energy development, which are contrary to the green development. The other side, EU officials, says that the threat of trade war will not force them to abandon the carbon charges. This was stated in an interview by the EU Commissioner for Climate Action Connie Hedegaard published in the Financial Times. "You can not threaten a trade war just because you do not like the European legislation. I think the majority of entrepreneurs in Europe understand that we cannot play this game in the 21st century," - said Hedegaard. Airlines will get the first bills for CO2 emissions in 2013. Carriers who refuse to pay an "environmental tax" may be fined. In special cases, they face a ban on flights over the territory of the European Union. At the same time the EU is ready to exempt from paying those foreign airlines, whose countries will introduce a similar tax. Meanwhile, economic development in BRICS is rapidly bringing humanity to the critical level of "growth limits." However, even ignoring this global context, experts think that the most effective way to counter this protectionism would be a domestic market for reductions of greenhouse gas emissions. According to Michael Yulkin, an expert of the Russian Union of Industrialists and Entrepreneurs, "BRICS countries need U.S. and European technologies, markets, capital ... In addition, all participants in BRICS have progress in the field of green technology much more than Russia. They are already developing alternative energy sources, subsidize green fees, encourage energy efficiency, use of local energy sources, and are seriously discussing the possibility of imposing taxes on CO2 emissions and domestic emissions trading schemes." However, even the joint working group of the Ministry of Economy and the "Business Russia" organized in 2011 that tries to comprehend and articulate the future carbon market in Russia have not yet earned tangible results. According to its Executive Secretary Anton Galenovitch, “no big optimism" is currently observed in the group. Now the "group" promotes a package of analytical documents to the State Duma. "We have to constantly prove to the Government and business that the theme of the carbon market needs to be addressed, and that this topic is not marginal." Olga Senova, the head of the RSEU Climate Secretariat, believes that low-carbon policies are needed in Russia. The Federal Law No. 261, aimed at improving energy efficiency, only outlined the intentions and the possibility of more rational and efficient use of energy in our country. There is no systematic approach to reduce carbon intensity of the Russian economy; this aim is not stated explicitly in the national papers, even in the Climate Doctrine. In the current situation, Russia shall not fight the trend of green growth, but transfer its economy on low-carbon rails as soon as possible. Only this can improve the competitiveness of our products in foreign markets and to ensure long-term sustainability of the Russian economy.